Windsor residents who haven’t stopped by Seminole Branch recently are in for a pleasant surprise when they return. New shelving, new flooring, a new external book drop and new seating provide a welcoming environment to area customers looking to ‘beat the heat’ and at the same time check out the many resources available which inform, entertain and educate. 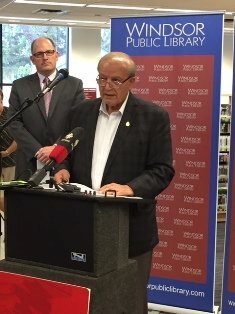 Representatives from the City of Windsor and Windsor Public Library gathered at the branch on Thursday, August 16 to officially reveal the renovations. Annually, WPL staff selects a branch to receive a small scale ‘face lift’ to improve the customer experience. Renovations to Seminole Branch cost over $73,000. Pictured are Mayor Drew Dilkens and Ward 5 Councillor Ed Sleiman at the podium. 2 Responses to "Seminole Branch Receives Some TLC"
Positive news for the neighbourhood, but some seem to forget that it was the very same WPL Board & WPL Administration who tried to permanently close the WPL Seminole Branch not to long ago. Always interesting the Windsor Mayor and local Councillor photo opportunity timing during a municipal election campaign. Perhaps the WPL could run photos of the dimensional measurements of the WPL (Mayor’s absurd Plan) plan to move the MAIN Library to the 5th floor of new City Hall and have the two pose in front of that as well! I would love to see photos of the updates!